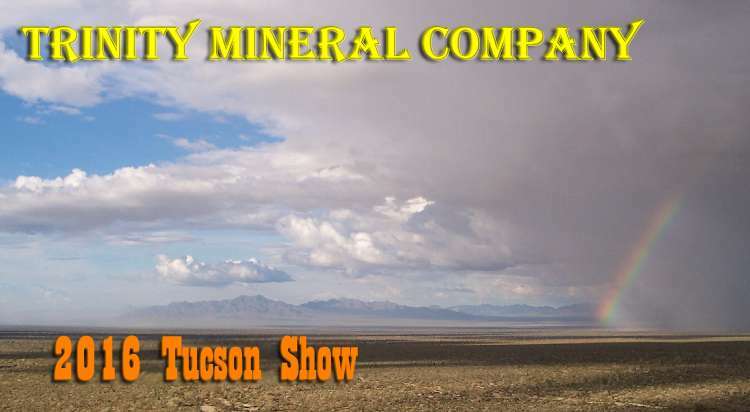 Welcome to the 2016 Tucson Show edition of the MineralShows.Com Tucson Show. There will be online auctions with mineral specimens for your consideration that will start January 29th and will close February 13th. I will be preparing several show reports on what I see that is new at Tucson and will be offering specimens from the show on my website soon after I get to Tucson. I will also be showing minerals in Tucson at two different venues. Visit Tucson Shows for more information. You can also follow me on Twitter and Facebook . I will be sending out regular "tweets" and notes on Facebook about what I am seeing at the various venues in Tucson. You can locate me on twitter.com under my name - "John Veevaert" or "Mineralshows". On Facebook search for me using my name - "John Veevaert" or my email which is "john@trinityminerals.com". I will oblige you. I will start the verbiage once I get to Tucson and there will be frequent messages sent out on what is new as I see it. Twitter & Facebook are easy and 100% free to use. All specimens from the Auctions and Tucson Show Galleries will be shipped after the 18th of February. I wish I was superman but to try and do it all would probably put me into an early grave... I am not ready for that yet.